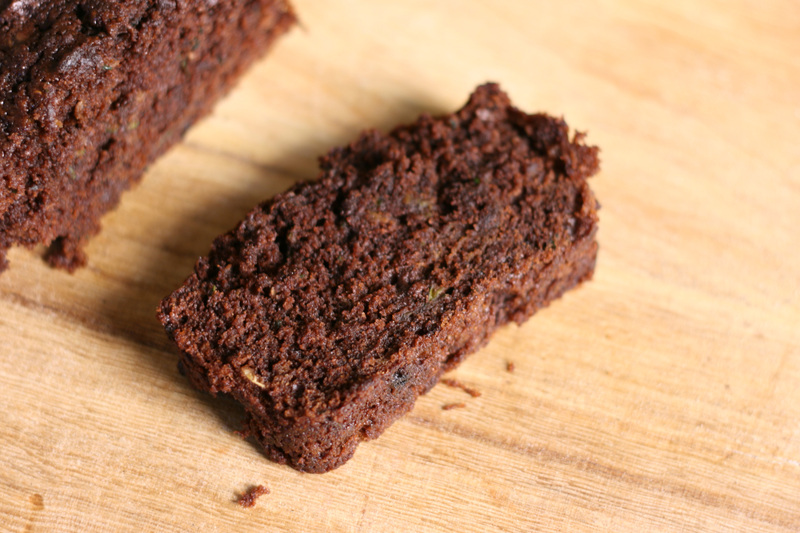 This chocolate coconut zucchini bread smells so amazing when it is baking. Unrefined coconut oil is great for baking because it has a delicious coconut smell and flavor. It adds just enough coconut flavor to the bread without being overwhelming. Coconut and chocolate are two flavors that go really well together. I have a hard time getting my six year old to eat vegetables and he was concerned that this bread would taste like zucchini. I did convince him to try it and after he ate the whole slice of bread said, “If you want me to eat zucchini, you just need to serve it like this!” So, this is definitely kid approved if he will eat it. Preheat oven to 350 degrees and grease two 9×5 inch loaf pans. In a large bowl, whisk together the melted butter and 6 tablespoons cocoa powder. Whisk in coconut oil, sugar, brown sugar, and vanilla until well combined. Add zucchini and mix well. In a medium bowl, mix together flour, cocoa powder, baking soda, salt, and cinnamon. Stir chocolate chips into the flour mixture. Add the flour mixture to the large bowl and fold together to combine. Pour evenly into the two loaf pans. Bake for 60-65 minutes, or until a toothpick inserted in the center of the bread comes out clean. This was good Jodi! Is it a pretty dense bread? mune didn’t rise much at all. Thanks for sharing! Thanks for trying the recipe. I’m glad you liked it. It is a fairly dense bread.